Opening reception: January 5, 2019 6-9 p.m. Catalog Launch & Closing reception: February 3, 2019 3-6 p.m.
February 3, 2019 3-6 p.m.
Ortega y Gasset Projects is pleased to announce Some Stuff You Forgot About, the NYC debut solo exhibition of artist Ben Pederson curated by artist and OyG co-director, Eleanna Anagnos. The opening reception is on Saturday, January 5, 2019 from 6-9 p.m. The exhibition will run through February 3, 2019 with a closing reception and catalog launch from 3-6 p.m.
Presenting in both the main gallery and The Skirt (OyG’s space for site-specific work), Pederson creates an immersive installation that reflects the depth and breadth of his practice. In The Skirt, Pederson creates a “reality-tunnel” that reflects the totality of his perceived experiences, both conscious and unconscious. 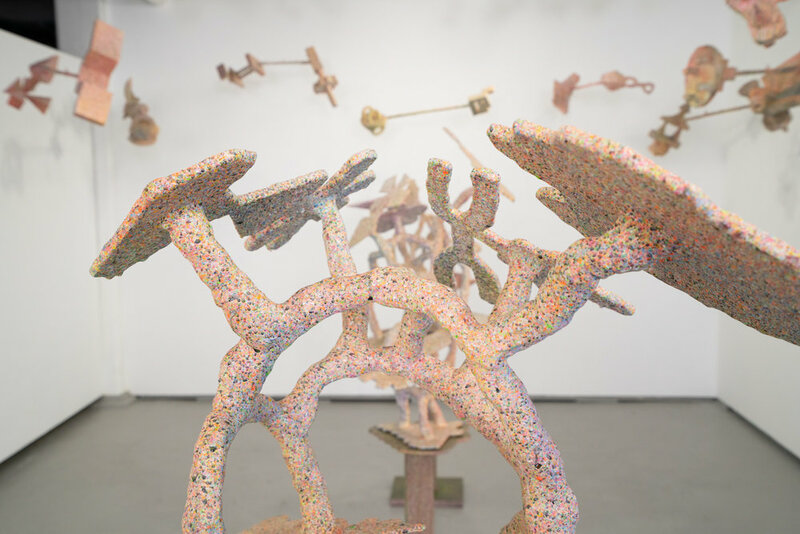 Large-scale hanging sculptures form a dense invitation to enter Pederson’s universe, disassembled and reassembled from earlier works of wood, paint, and childhood ephemera. 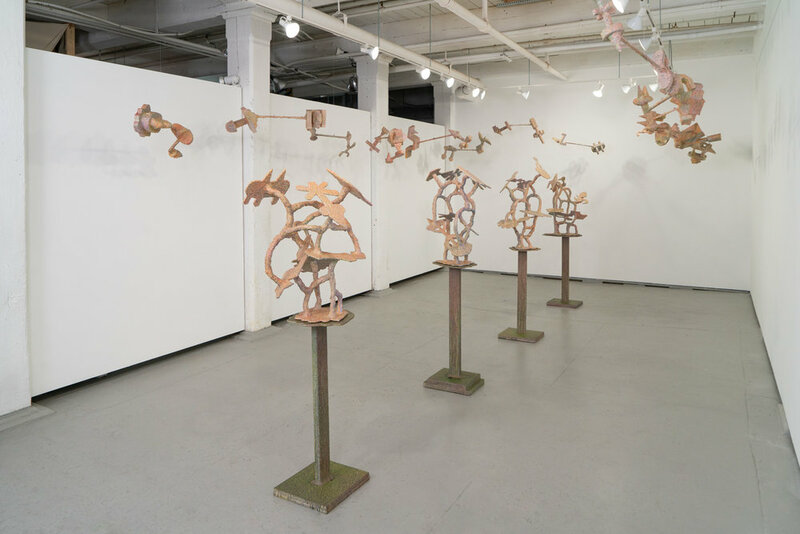 In the main gallery, 28 Shapes Later is an investigation into the artist’s changing views on the Transcendent vs. Immanent aspects of his process that begs the question: does creativity come from above or within? Fourteen horizontal, balanced rods hang from the ceiling and spin in relation to air movement, casting shifting shadows. These are flanked by tree-like vertical sculptures on custom pedestals that contour to the sculpture’s base. 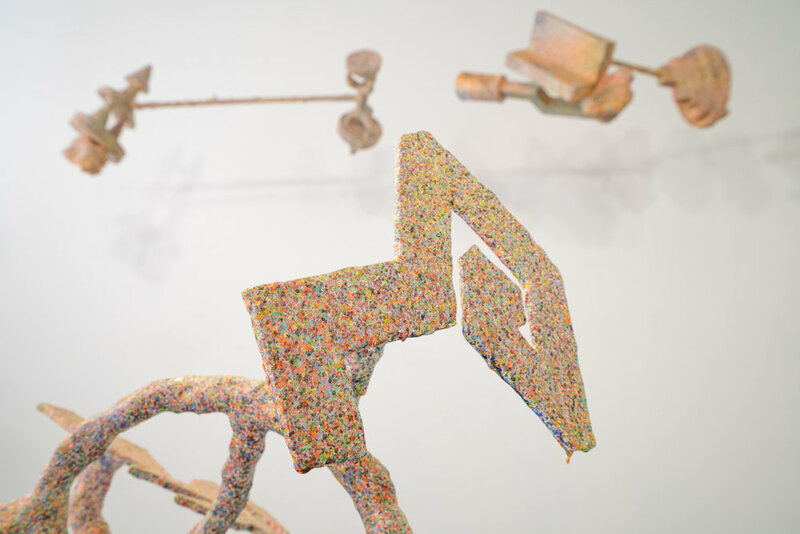 Speckled with bright, sometimes, fluorescent paint, the sculpture’s surfaces unify to create a neutral tone when viewed from afar. Twenty-eight corresponding watercolor silhouettes - realized from a meditative state - act as a visual key that links the family of forms in the exhibition. Pederson likens his practice to childhood memories of sifting through a junk drawer, hot glue gun in hand. Disparate, seemingly unrelated ephemera is united and form new, hybrid connections. This points to the more prevalent, essential “junk drawer” occupying his heart and mind: a sea of experiences, dreams, failures, and triumphs that he sifts through to create meaning out of the absurdity of life. A catalog launch and closing reception for this exhibition will take place on February 3, 2019 from 3-6 p.m.
Ben Pederson (born 1979, Grand Rapids, MI) is a Brooklyn-based artist. He shows his work locally and nationally. Pederson is the recipient of the Pollock-Krasner Foundation Grant (2018); a Yaddo Fellow, Saratoga Springs, NY (2015); the Skowhegan School of Painting and Sculpture residency in Skowhegan ME (2013); and the Materials For The Arts Residency in Queens, NY (2013). He received his M.F.A. in Sculpture from the University of Massachusetts, Amherst (2007) and a B.A. in Studio Art from Aquinas College (2003). Eleanna Anagnos (born 1980, Evanston, IL) is a Brooklyn-based artist and curator. She has received awards from The Rauschenberg Foundation (2019); The Grant Wood Colony (2018-2019); Yaddo (2017); BAU Institute (2016); The Anderson Ranch (2011); The Atlantic Center for the Arts (2009) and The Joan Mitchell Foundation (2011, 2009). Her work has been featured in The New York Times, Hyperallergic, Artnet, and The New York Observer, among others and her curatorial project Wish Me Good Luck, was reviewed in Art in America (2017). She exhibits her work nationally and internationally with her debut NYC solo exhibition slated for April 2019 at High Noon Gallery. Eleanna has been a Co-Director at Ortega y Gasset Projects since 2014. She earned her MFA in Painting from the Tyler School of Art (2005) and a BA with honors and distinction from Kenyon College with a concentration in Women’s and Gender Studies (2002).